VERITAS Transfer/Log Scribe It can transfer wall or moulding profiles onto an abutting panel. Used as a log scribe, it accurately scribes the contour of one log onto another. The bi-directional bubble levels make it a very versatile tool. 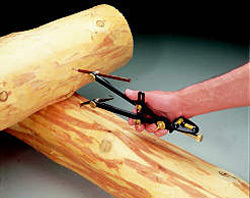 SHINWA Log Scriber Do you make furniture, fit out interiors or build log cabins? Then take a long, hard look at the SHINWA log scriber: it transfers an existing profile directly to the piece of timber that you want to fit. 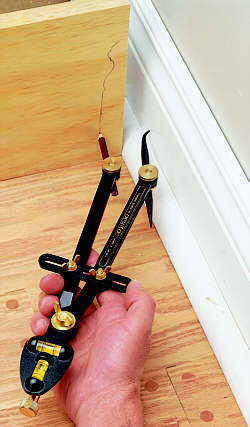 The trick is to hold the scriber so that the two vials of the spirit level are horizontal in both planes. 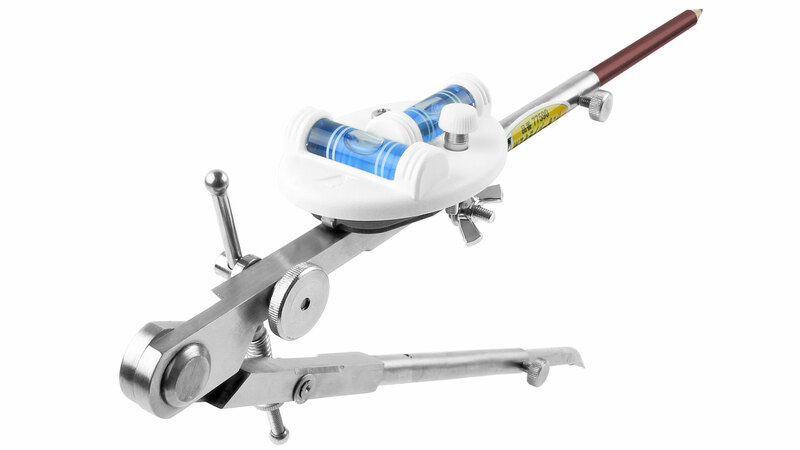 Initially it takes a bit of practice to hold the scriber level without support, but once you have mastered this detail, you’ll have an indispensable assistant to call on. The vials are relatively large and exceptionally easy to read - thanks also to the light-blue fluid and the wide graduation marks in white. Neither the pen nor the tracing tip has a joint for changing their angle. The marking pen needs to be sharpened before use. The tracing tip can be replaced by a second pen for marking two lines simultaneously. Lines drawn on a dry surface can be erased. On a moist surface the line colour changes to blue and cannot be erased anymore. The dividers are made of rustproof stainless steel, the spirit level of plastic. Set of 2 Repl. Pencils for SHINWA Log Scriber These waterproof pencils have to be sharpened before use.